I just spent some time in an operations discussion, and I quickly realized the path that the team was taking was wrong. It was a classic enterprise IT system approach to collect all the requirements, get all the people on board, lots of meetings, create an enterprise IT solution that meets the requirements. Spend millions of dollars on the system and pray that it will deliver. Lots of process. More people add more errors. Move at the pace of meetings. limited by how fast people will type, and review. Another example of how things don’t work is in hospital care. Here is a NYTimes op-ed piece. The piece closes with a possible solution to the problem. Hospitals are supposed to take care of the sickest members of our society and uphold the highest standards of patient care. But hospitals are also charged with teaching doctors, and every doctor has a first mistake. The only thing we can do is learn each time one happens, and reduce future errors in the process. Having a consistent gathering to talk about the mistakes goes a long way toward that goal, and just about any institution, public or private, could benefit from a tradition like M and M. It is not enough to stop the practice of defensive medicine, but when doctors are asked by their colleagues to justify the tests they ordered and the procedures they performed, perhaps they will be reminded that more is not always better. It is amazing how so many systems are not focused on catching the errors and addressing them. The #1 mistake I see is when people can’t see that the system itself is full of human errors. How can you run operations with an IT system that introduces more errors on top of the problems you are trying to fix? 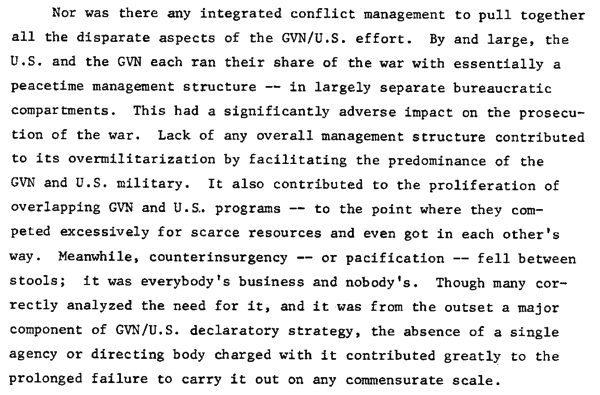 The Bureaucracy of the Vietnam War comes to mind as something that introduced more problems than it solved. Being closer to the problem and understanding the impact is something that I think works better.